When I began working as a prison warden, I was the spokesperson for the media at a men’s maximum-security prison. Several serious incidents attracted the attention of local radio and TV stations. Reporters would drive up in vans and pepper me with questions. I tried to assure them that we had the incident under control or that the emergency would quickly be resolved. But they seemed interested only in the worst news. It wasn’t worth their time to hear about a successful program or about positive changes occurring in the prison. Good news doesn’t sell. It was a story of an escape attempt, a riot, or a hostage-taking that made “good” news. The Bible has its share of negative news, too. We can’t avoid reading of our sinful condition. We long for a word of hope, a promise of something better. From the beginning, Jesus’ birth is the good news we need. He upholds the oppressed and the alien, feeds the hungry, gives sight to the blind, heals the sick, and loves us passionately. Hungry for some good news? You’ll find it in Jesus Christ. 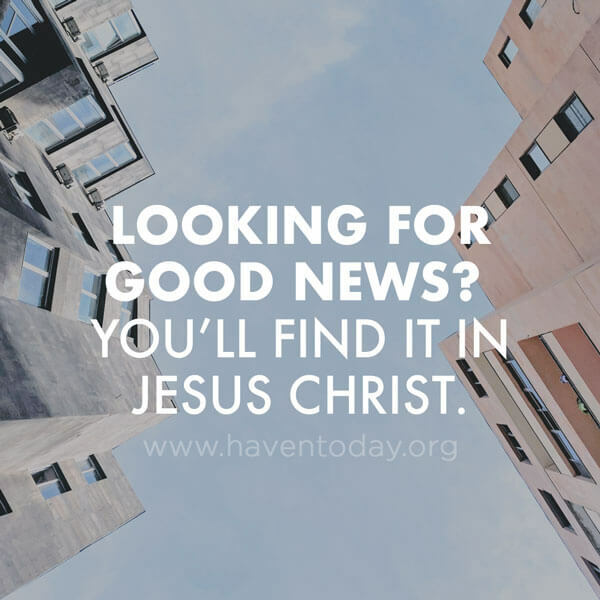 Whatever good news you need, Jesus is there just when we need Him most. Tell others and spread the Word.